Made with only the freshest ingredients to jump start your day, our Avocado Herb Toast is your one-stop for a complete breakfast that will leave you feeling satisfied! All atop our flax and spelt bread, layers of creamy basil pesto, house made (100% plant-based) mayo, and oregano are topped with perfectly ripe heart-healthy avocados (and a little salt and pepper) to finish off this mouth-watering toast! 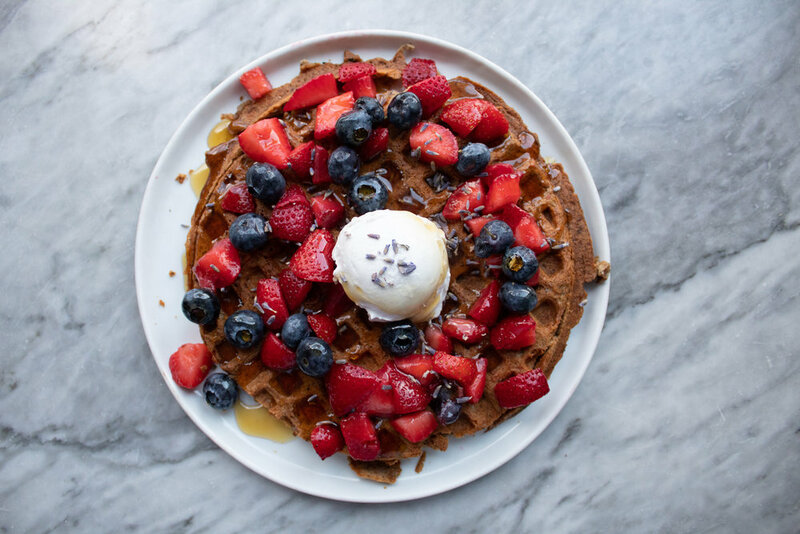 We love it for breakfast, but if we’re honest, its perfect any time of the day! Heart-healthy avocados are only the start to the nutritional value this toast brings to the table! Not only are avocados good for the heart, but they also promote healthy digestion and good blood sugar regulation. That’s not even to mention all of the omega-3 and omega-6 fatty acids that are in this little fruit! All built on our flax and spelt bread, an excellent source of nutrients and anti-oxidants, the health benefits keep going with oregano, black pepper, and our basil-pesto and mayo! Looking for something sweet to start the day that you can feel GREAT about eating? 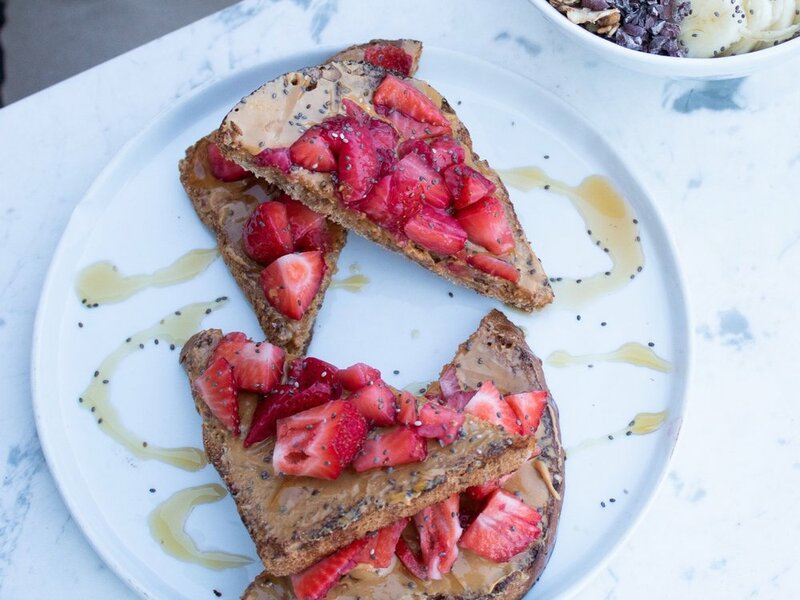 Introducing our Strawberry Peanut Butter Toast! A beautiful combination of sweet, fresh strawberries, house-made peanut butter topped with sweet agave and nutrient rich chia seeds! All made on top of our veganic flax and spelt bread, this is a sweet bite that will satisfy even the biggest cravings, without the guilt! What could be better?! Flax and Spelt bread is RICH in omega-3’s and fiber, while sweet strawberries have an “expensive” amount of phytonutrients, such as ellagic acid and ellagitannins, which have been noted as anti-cancer substances of special interest. More specifically, strawberry phytonutrients may be able to boost the enzymatic activity of certain detox enzymes like catalase or superoxide dismutase (science rules!). Protein-rich peanut butter and our plant-based sweetener, agave, work together to aid in blood sugar regulation and also aid in weight management! 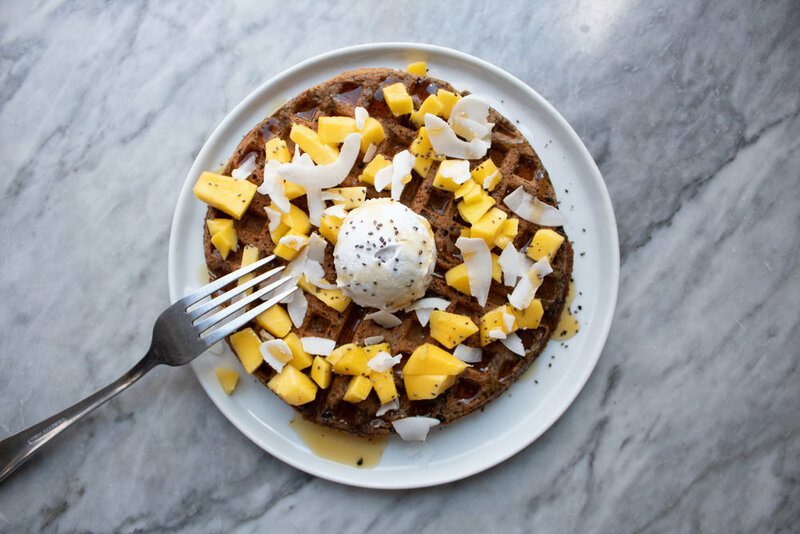 We top off this beauty with a healthy sprinkle of chia seeds, known for keeping you fuller for longer, lowering blood pressure and cholesterol, and aiding in weight loss! We call that winning!